Mangoes provide significant amounts of folate and vitamins A, B-6 and C, making them a nutritious fruit choice. Although they aren't a weight-loss miracle food, eating more of these and other fruits may help you reach your weight-loss goals a little sooner because of their high fiber content and low-energy density. 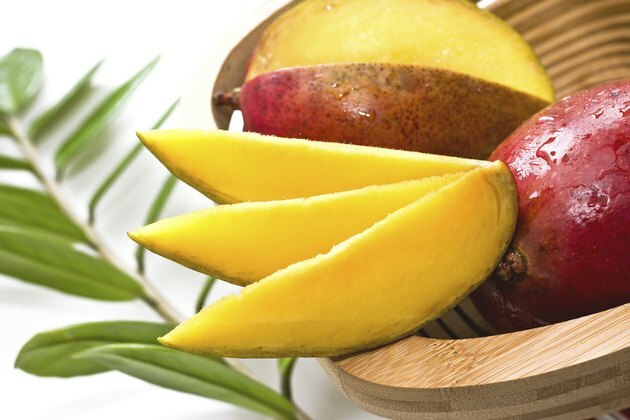 Replacing some of the less-healthy foods you eat with fruit, such as mangoes, may help you lose weight. A study published in "Nutrition Research" in April 2008 found that overweight people who ate higher amounts of fruit lost more weight than those who ate less fruit. Each 3.5-ounce-per-day increase in the amount of fruit that study participants ate led to an additional 0.7 pound of weight loss by the end of the six-month study. Foods that are lower in energy density, or calories per gram, tend to make it easier to lose weight because you can fill up on fewer calories than if you ate foods higher in energy density. Mangoes have 0.6 calorie per gram, making them very low in energy density. Fill at least half of your plate with low-energy-density foods, such as mangoes, other fruits or nonstarchy vegetables, to help you limit the amount of calories you eat per meal. Foods that provide fiber can also help with weight loss. These foods may help increase feelings of fullness and decrease absorption of macronutrients, such as fat and carbohydrates, according to an article published in "Nutrition" in March 2005, making it easier to lose weight. Each 1-cup serving of mango has 2.6 grams of fiber, or about 10 percent of the daily value for fiber. Eating mangoes won't cause any weight loss if you just add them to what you are already eating, thus increasing your calorie consumption for the day. To lose weight, you need to eat less and exercise more to create a calorie deficit. Each pound of weight loss requires a 3,500-calorie deficit. Eating mangoes and other low-energy-density fruits and vegetables just makes creating this calorie deficit easier by helping you feel full without going over your daily calorie goals. Centers for Disease Control and Prevention: Can Eating Fruits and Vegetables Help People to Manage Their Weight? What Are the Benefits of Eating Prunes? Do Avocados Have Side Effects?